Bhutan Association of Women Entrepreneurs (BAOWE) considers that a lack of Access to finance is a key issue for women entrepreneurs that are negatively impacts agro-businesses and ultimately ‘Brand Bhutan’. They are seeking support both financially and technically to develop a program supporting grass root entrepreneurs raising their product volumes and quality standards and importantly establishing agro-processing facilities to add value to agriculture products. A key aspiration of the organization is to develop inclusive business practices with their innovative ideas for pump-priming micro and small businesses with investment for infrastructure, supplemented by skills development. Their business module idea is to partner micro and small business, managed by young entrepreneur’s mostly single mothers, unorganized sector (women) and disadvantaged youth with the aim to create self-employment and employment. The plan involves BAOWE sourcing funds for infrastructure development, building capacity and identifying entrepreneurs (specialists) who in turn employ young women to intern who upon completion of their internship are awarded similar projects in other parts of Bhutan. His business development module is described as producing a ‘Fountain Effect’( with synergies gaining momentum and resulting in socioeconomic benefits for individuals and communities), which would also include the development of community–based business hubs which offer infrastructure investment, business development support, employment, skills training and livelihood opportunities. The entrepreneurs is ‘gifted’ the project free of cost to meet stressful repayment of loans etc, leaving her free to promoting her business. She will be required to plough back of net profit to BAOWE generating funds for sustainability and expansion of similar projects in other parts of the country. The Fountain Effect Concept was developed by BAOWE in response to the challenges faced by farmers including low volumes of produce and lack of marketing networks thereof. The government has developed infrastructure including building farm roads, farm shops and providing connectivity however the gaps resulting from low volumes of primary produce and high labour cost does not promote effective commercialization of products. This could be one of the reasons leading to the inability to exploit the potential available vis-à-vis supplying the growing global demand for healthy foods. The lacks of volumes require targeting niche market, capitalizing on Bhutan’s pristine environment, fertile soils and fresh water. Value addition will not only fetch better prices but also provide employment and self-employment opportunities and contribute reducing rural to urban migration. The Fountain Effect creates synergies between the primary suppliers and entrepreneurs (manufacturers) aggregating small volumes of primary produce through collection linkages, building substantial, sustainable and economical raw material supply chains. To elaborate ,one can imagine a village growing mushrooms .A single farmer would perhaps harvest five kilograms of mushrooms a day, which she would sell sitting on the roadside. This would entail a whole day with no guarantee of success including the risk of her highly perishable mushrooms spoiling .Adopting the Fountain effect Method would include her in the supply chain involving a few hundred villagers meeting the raw material requirement of a rural entrepreneur. Since the manufacturing unit is located near or inside the village, logistics would be cost effective including planning, ‘Just in time’ supply chains. Involving the primary producers at inception will create bonding and give a sense of ownership. The entrepreneur would have consistent, cost effective raw material supply which would bring down manufacturing costs. She in turn would reward the primary producers with a share in net profits thereby creating the FOUNTAIN EFFECT. 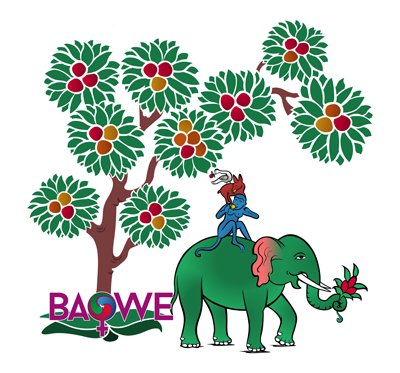 Through its experience working with Self Help Groups across the Country, building livelihoods and empowering through entrepreneurship, BAOWE is promoting the Fountain Effect methodology to benefit rural community building livelihoods and effectively main streaming them into the socio economic plans of the country. It is clear that innovation could be at the core of its support program component and approaches should be designed both ‘top –down’ and ‘bottom-up’ to enable the testing of grassroots business development modules and sustainable solutions to address problems of Access to Finance; youth unemployment and women’s equality. The “Four Harmonious Friends” is one of the beloved tales from Bhutan. The image of a bird, rabbit, and monkey standing on each other’s shoulders on the back of a patient elephant portrays social and environmental harmony. As the story goes, the bird finds a seed and plants it. Then, the rabbit waters it, and the monkey fertilizes it. Once the seed sprouts and begins to grow, the elephant protects it. The small plant grows into a big, beautiful tree full of healthy fruits. Working together synergising their individual talents, the four friends enjoy the fruits and inspire the rest to join their journey (network) to make a collective difference, harmoniously. The White Bird signifies Wind (Space) and media, donors and partners. The Elephant (Primary producers) aggregate raw material supplying to the Red Rabbit (Entrepreneur) through the method of the Blue Monkey (entrepreneurship). In its turn, the Blue Monkey value adds and shares a part of profit with the Elephant (primary producers) thereby building harmonious sustainable synergies: THE FOUNTAIN EFFECT.